Athens Photo Tour works with an extensive network of pro photographers helping travellers to hire a photographer in Santorini island, without the hassle. You are booking a local professional photographer with knowledge of scenic spots and best times to visit throughout the season. We have been offering photoshoots in Greece, especially in Santorini for the past five years. Our Santorini Photographers offer photoshoots, surprise proposals, honeymoon photoshoots and more. We host more than 250 photoshoots in Santorini alone, maintaining a five star review rate! Check out our Tripadvisor reviews. We removed the hassle for anyone want to hire a photographer in Santorini. Let’s start talking to organise your Santorini Photoshoot. Have you been thinking about booking a tour with us on your upcoming travels in Greece? Yes? Ok, that’s cool! We are now offering Gift Cards, so your loved ones can gift a certain amount towards your next booking. Pretty cool, eh? Read on as this will certainly interest you. We are offering different Gift Cards 50 euros, 100 euros. 200 euros or any other amount, which can be used in a variety of Tours. Like the Morning, the Evening, the Night, or even our newest Athens Sunrise Photo Tour. 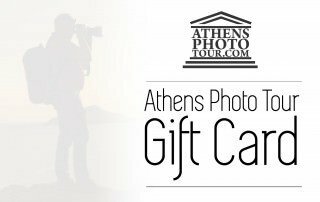 You can even slice a 200 euros gift card from our daily photo tours, the Athens full day Photo tour, or the Peloponnese full day Photo tour. Athens Photo Tour is a registered tour company offering specialized photo tours in Athens and most iconic parts of Greece. All photos copyright by Athens Photo Tour. All rights reserved. Greek islands photography tours and why you should join one!